The Discoverer iD should become one of MH-W most popular models. 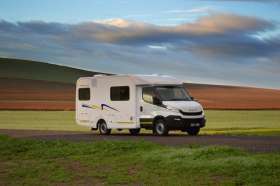 Here we have created an affordable, compact and luxury motorhome, with an large island bed. It took a long time to get the layout to this level. it still has all the features, all motorhomers expect in a Discoverer motorhome, but now with the ever popular island bed. Available in 2 versions, one as a 2 sleeper and another as a 4 sleeper. The 2 sleeper is available on either an IVECO or Mercedes Chassis. I am interested in the "Discoverer iD4".